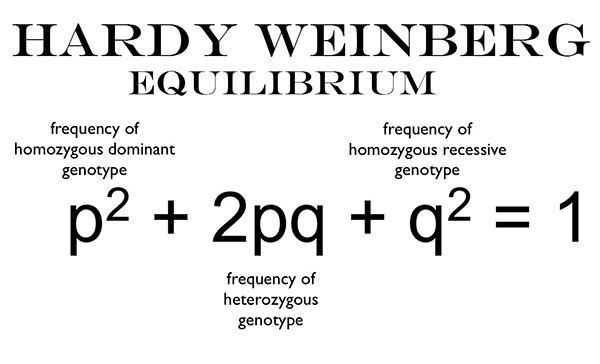 Hardy Weinberg Equilibrium was the combined idea of English mathematician Godfrey H. Hardy and German physician Wilhelm Weinberg. They independently derived a mathematical model in 1908. This model explains what happens to the frequency of alleles in a population over time. It states that If certain assumptions are met, evolution will not occur because the allelic frequencies will not change from generation to generation, even though the specific mixing of alleles in individuals may vary. The population size must be large. Gene frequency does not change by change in large population size. Mating within the population must be random. Every individual must have an equal chance to mate with any other individual in the population. In non-random mating some Individuals can more reproduce than others. Then natural selection may occur. Therefore, mating should be random. Individuals cannot migrate into, or out of, the population. Migration may introduce new genes into the gene pool. It can add or delete copies of existing genes. Mutations must not occur. Or mutational equilibrium must exist. Some mutations take place from wild type allele to a mutant form. Some mutations occur from the mutant form back to the type. If both these mutations are balanced then mutational equilibrium is established. Thus, no new genes are introduced into the population from this source. These assumptions stop the change in allelic frequencies. Therefore, evolution does not occur. These assumptions are restrictive. A real population cannot meet these conditions. Therefore, evolution occurs in most populations. However, Hardy Weinberg Equilibrium provides a useful theoretical framework. The changes in gene frequencies in populations can be examined by this theorem.